No, no, no – despite the fact I’m rapidly approaching 35, this is not a post about the annoying grey hairs I keep finding, but rather about my new found love of this “colour” as we continue with #projectselondonhome in 2015. I’m a bit of an all-or-nothing person and when I think about colours for me they have to be bold and take no prisoners. I really struggle with pastel shades even though I do appreciate that everything has its place. 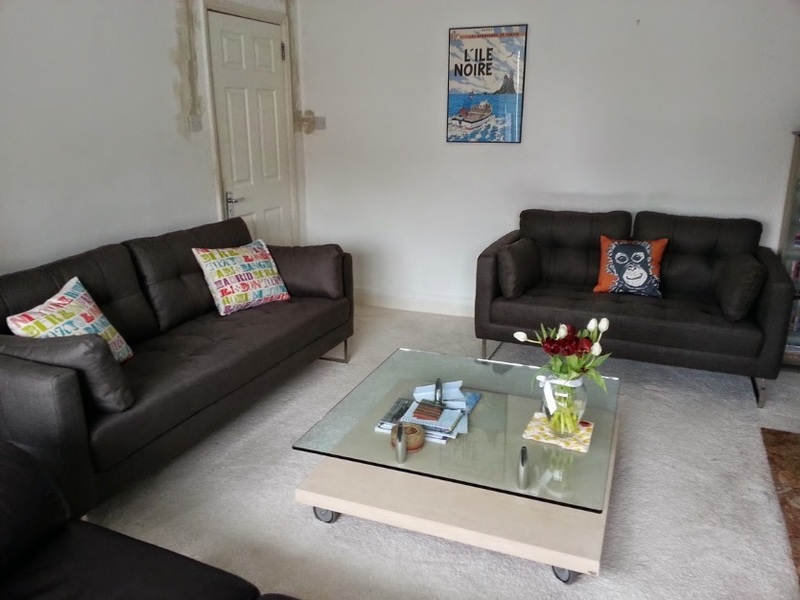 The first bit of grey we introduced into our home came in the form of the sofas we picked out for the living room. 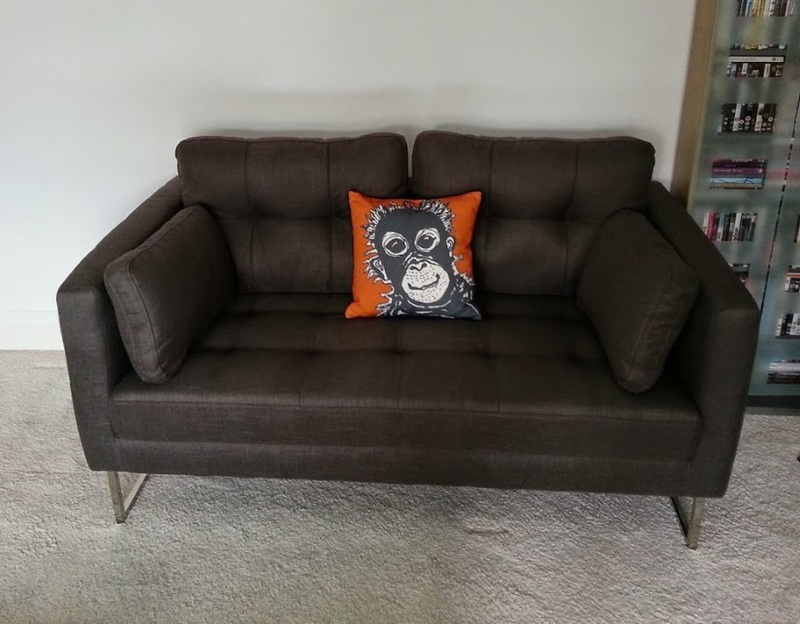 We temporarily made use of a leather sofa that OH had had in his bachelor pad years ago but well, it was brown. And leather. And these just don’t rate highly with me. We wanted sofas that would be practical but stylish, comfortable but hide the sins of a puppy and kitten and so chose our three seater and matching two seater from Dwell. 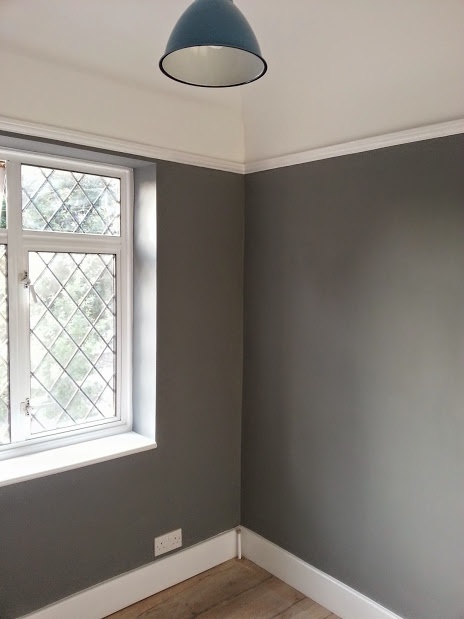 Nearly a year later and I still haven’t figured out a second colour scheme for the living room, but this is the beauty of grey – it goes with EVERYTHING. Mustard, orange, teal, pink, purple, the list is endless. Not what my often indecisive mind needs. 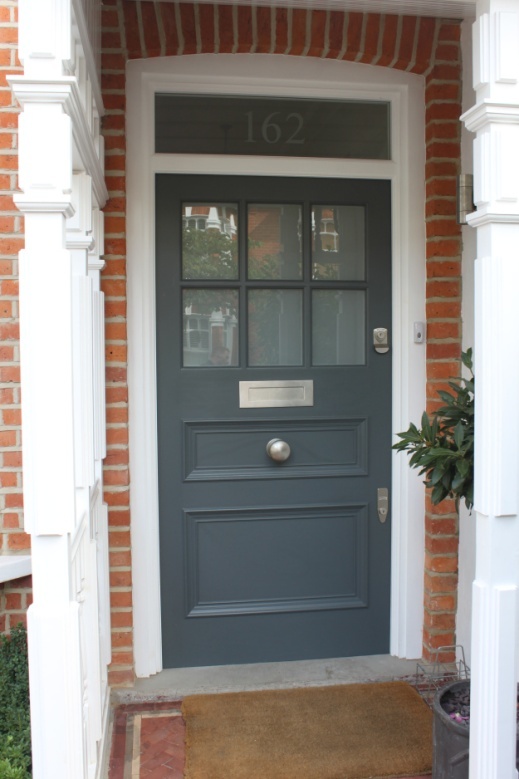 The next grey inspiration I am lusting after is this beautiful front door. We’ve been wanting to change the front door more or less since we moved into the house and although we both know that you shouldn’t judge a book by its cover, ever since I saw this door I haven’t been able to unsee it! 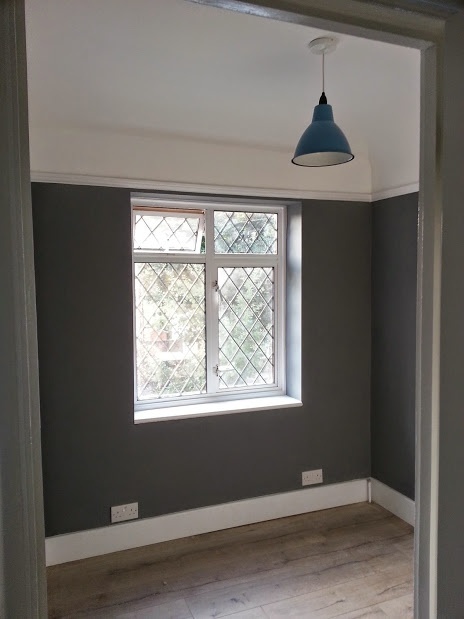 The colour used is Farrow & Ball Down Pipe and it looks so classic. 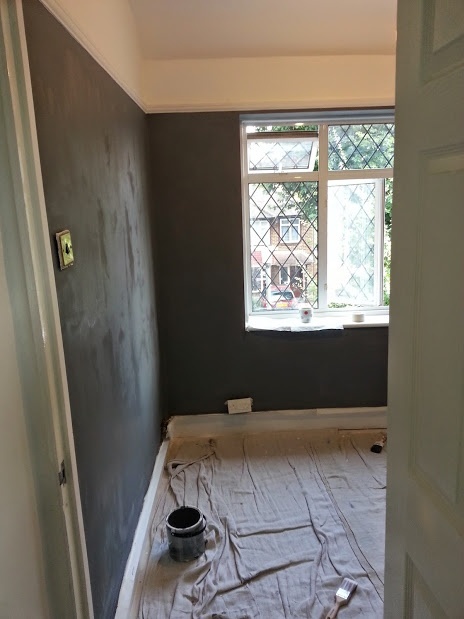 Last but by no means least, we’ve covered an entire room in our house in dark grey paint (“City Break” by Crown). This is definitely one of the bravest moves we’ve made since we moved in and thankfully it’s only a small room so it wouldn’t have cost too much to repaint had it been a complete disaster. Far from it though, it looks amazing. My inspiration came from an image of a home office I saw on Pinterest where the walls were grey but all other features of the room were white and then finished off with a mix of colourful accessories. It looked absolutely stunning. 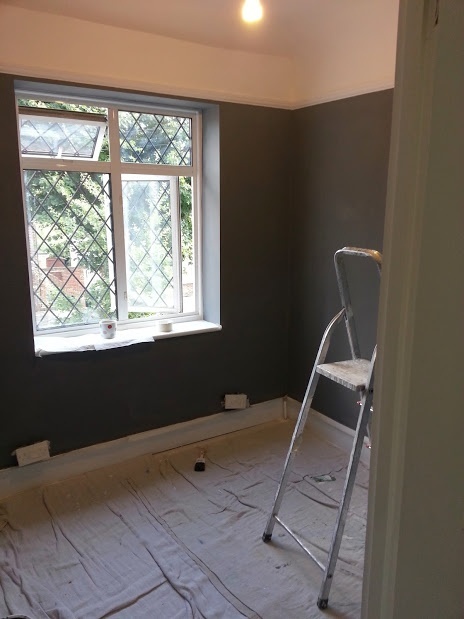 Again grey is never a colour I would have chosen but it works brilliantly. Have you got a favourite colour, maybe something you never thought would work? I’d love to hear what your inspirations are. Voysey & Jones have left over 100 customers with lost money and no doors, as they go into liquidation with hundreds of thousands of unpaid debts. You should maybe take down this blog recommending them. Thank you so much for making me aware of this, I had no idea. I’ve now removed their links from the post.